How would you feel if you were able to achieve any goals in life, without being weighed down by the pressure? Imagine if you always felt powerful and in control of new situations. To be successful and achieve great things in life, we’re always told to set goals. Goals are important as they can help us focus, they allow us to track our progress, and of course they hold us accountable. But I believe that being too focused on the goal can be counter productive as it misses the point of what it means to achieve success and happiness. are the most important things you can do if you want to be successful in the long run. My first business was a luxury homeware franchise. As is typical with franchises, the homeware brand that gave me exclusive rights to sell their products in my territory, imposed strict minimum order values. So in order to keep the exclusive rights, I had to buy X number of products from them every year, without fail. For years, I put a huge amount of pressure on myself to achieve this. When I didn’t quite hit the target, I felt like a failure, and was always dreading the bi-annual trips to Paris for the meetings with the brand owners. It was only years later when I was working on a different business, that I realised that these targets seemed to have been randomly picked. Worse still, had I not been preoccupied with always hitting them, I would have enjoyed the process more and as a result I would have performed better and been more in flow. Striving towards this goal meant that I lost sight of my overall ambition, which was to run a successful, thriving business. You don’t ever have complete control over the outcome of a situation. What you have control over is yourself, your thoughts, your attitude and your behaviours at any given moment. Achieving a specific goal is not in your control. Be careful not to confuse a vision with a goal. A vision is a more broad, open-ended idea of your future, which draws more on your emotions and feelings. Goals on the other hand are more quantifiable, but they’re also more rigid and inflexible. Telling yourself you want to land a particular job is a goal, not a vision. What happens if you don’t get the job? Well, then you feel you have miserably failed. 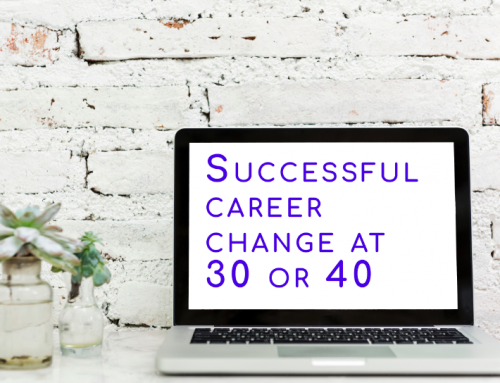 If on the other hand your vision is to ‘land a job which gives me meaning, plays to my strengths and lets me spend time outside’ – then you are more likely to achieve success, as there is much more flexibility to achieve this. Do you notice that as well as being broader, the vision, unlike the goal, contains purpose and significance? The vision is the ‘why’, it’s the driver, the passion and drive behind why you’re doing what you’re doing. I can strongly recommend practising regular visualizations for making your visions come to life and really light the fire inside you. Personally I’ve enjoyed the book Creative Visualization by Shakti Gawain, but at it’s core visualizations are simple – Imagine what you desire playing out vividly in front of your eyes, like a movie, with you being the main actor. Try to really feel what you would feel in the situation you’re playing out, and let the excitement and thrill sink in deep. Research has shown that imagined scenarios use the same brain circuits as scenarios played from memory. This means that when you visualise effectively, to you it IS real. Not only does it feel amazing, but it gives you incredible motivation and drive to work towards making the vision reality. There’s another factor equally important as vision; and that is ‘process’. Focus on the process means being fully tuned in to the here and now. It means being focused on the real time actions you can control in order to improve your situation and get you closer towards your vision. The key is that for each obstacle you experience, you use the feedback you’re getting to fine-tune your trajectory. This includes the external feedback, such as other people’s advice and the visible results, as well as internal feedback (what the experience felt like, and did you enjoy it). Don’t worry about knowing what to do 3 steps ahead. You only need to know the next action, and perform it to the best of your ability. If you keep doing this on repeat, adjusting your course of action as you evolve, you will eventually and absolutely achieve success. This realisation marks a vital difference between ordinary and successful people. Ordinary people obsess about goals, which means they stunt their growth. They are so focused on the final destination, that they don’t pay enough attention to what’s right in front of them. Right there in front of you are countless opportunities to improve, refine and flourish. This is what I mean about the process being more important than the goal. People who are truly great at something, become great because they practised their skill, every day for years. People become successful because they focus on the here and now, on what’s in their control at this given moment. They make sure the skills they’re refining are always in alignment with their vision. They also don’t waste their thoughts on comparing themselves with their peers or their neighbour. If you accept and realise that what you are in absolute control over every day are those opportunities to learn and to grow, NOT the goal to hit a specific sales target or beating your colleague to the promotion, then you are setting yourself up for long-term success. By focusing your attention on the process, you’re also getting rid of the self-imposed pressure to ‘hit the goal’. A bit of pressure is healthy and makes you work that bit harder, but often it obscures our view and takes our attention away from what we can actually improve and control. Once you realise that the clever thing to always aim for is not to beat people at their game, but improving your past self, you are truly setting yourself up for lasting success. If you want to feel truly happy and successful in the long run, I urge you to think in terms of what your vision is, rather than what your goal is. Keep the vision broad and emotions-based to make achieving it more realistic, and make it come alive by playing with visualization techniques. Accept that all you can control is what is happening in this moment, in terms of the thoughts and behaviours you’re exercising. Honour the process by doing the best you can in each situation, and learn from them all. Always strive towards becoming the best YOU can be, ignoring who you perceive to be your competition. So don’t try to hard. If you focus on your vision and the process, it is inevitable that success will eventually come find you. This is such a great blog, and resonates hugely with some modules on my recent Masters course around ‘minimal structures’ for bringing about the conditions for creativity. I always used to think that being in control was the right and only way to achieve things, and also that the people who had all the tangible goals had their lives more on track than I did. But I’ve realised that not attaching to those goals and pre-conceived ideas of success leads to a better life because I embrace other outcomes that might be just as ‘good’, or ‘better’.